Pan-roasted chicken‘s been done on this blog before, but some nights you just don’t have time to deal with cutting up a whole chicken and brining it. This is a great recipe for a weeknight evening. The initial browning can give you the base for a nice gravy as well, if you prefer that. The potatoes are quick as well, since they are mostly cooked after 10 minutes in the microwave. To complete this recipe in 30 minutes, preheat your oven before assembling your ingredients. If the split breasts are of different sizes, check the smaller ones a few minutes early to see if they are cooking more quickly, and remove them from the oven if they are done. Making the Minutes Count: While the chicken browns, cut the potatoes. 1. Heat Oven: Adjust oven rack to lowest position and heat oven to 450 degrees. 2. Season and Brown Skin Side of Chicken: Pat chicken dry with paper towels, and season with salt and pepper. Heat 1 tablespoon of oil in 12-inch nonstick skillet over medium-high heat until just smoking. Brown chicken well on skin side, about 5 minutes. 3. Microwave Potatoes: While chicken browns, toss potatoes with 1 tablespoon of oil, 1/2 teaspoon salt, and 1/4 teaspoon pepper in microwave-safe bowl. Cover tightly with plastic wrap. Microwave on high until potatoes begin to soften, 5 to 10 minutes, shaking bowl (without removing plastic) to toss potatoes halfway through. 4. Bake Chicken: Transfer chicken, skin side up, to baking dish and bake until thickest part registers 160 degrees on instant-read thermometer, 15 to 20 minutes. 5. Brown Potatoes: While chicken bakes, pour off any grease in skillet, add 1 more tablespoon oil, and return to medium heat until shimmering. Drain microwaved potatoes then add to skillet and cook, stirring occasionally, until golden brown and tender, about 10 minutes. 6. Make Drizzling Oil: Whisk remaining 3 tablespoons oil, lemon juice, garlic, thyme, and red pepper flakes together. 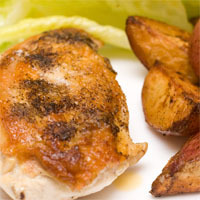 Drizzle oil over chicken and potatoes before serving. After seeing 28 apartments over the past week, we decided to take one in Menlo Park. Lemon tree and lots of rosemary on the premises. Within 0.5 miles of our place: downtown (Caltrain, year-round farmer’s market, bookstore, Trader Joe’s, lots of stuff we don’t know about yet), library, and park. Looking forward to having a place of our own after spending time at Jess & Cy’s and corporate housing. It’ll be great to have our stuff back as well as a long-term mailing address. Our guide, Olivier, stops us at the top of a small hill. The thick vegetation has been cut away to form a small clearing. Moments before, we had taken off our packs because the gorillas were close by. A tracker had been following the family all morning and communicating their location back to us. Suddenly, Olivier makes us step aside as a black creature scurries up the hill past us. We descend down the slippery slope, trying to find footholds and handholds in the dense vegetation. Mist surrounds us; it has been drizzling all morning. We’ve been hiking for about an hour with our guide and armed guard. Half an hour of it was through the farmland surrounding the park. We reached a 3ft-high stone wall that marked the forest boundary. We climbed over it and spent 25 minutes trekking through the dense forest in search of the Umubano family. The hike has been very difficult – slippery, muddy, and steep. The stinging nettles are plentiful and I feel their painful stings through my pants. Sliding down some of the slopes is sometimes the fastest, most graceful way to get to the bottom. We finally catch up to the gorillas when they stop to have breakfast. We go off the trail and into the vegetation. Olivier hacks through it with his machete to give all of us (including the gorillas) more room to maneuver. Charles, the huge silverback, plods towards us and Olivier pushes us out of the way. 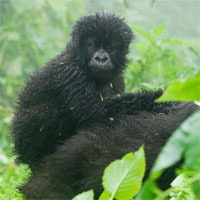 We spend an hour observing the family of eight gorillas. Olivier makes grunting noises to soothe them. They do not feel threatened by us, and we take care to not make any sudden or menacing motions. A young gorilla hangs out under Charles’ watchful eye. They eat methodically. Their faces are striking in their humanity. Our time with them flies by, and they start heading out before the hour is up. A baby hitches a ride on its mother’s back, and we follow them up the hill. We get one last look at them as they disappear into the misty jungle. The young one spins around playfully once, as if to say good-bye. Later we learn that another group of our travel companions got to see something more exciting – one of the younger males sneaking a quickie in with one of the female gorillas while the silverback was away, a definite no-no in the social structure. 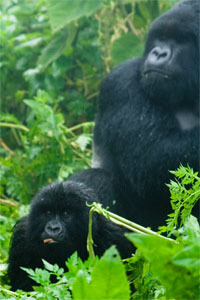 The silverback is the leader and protector of the group, and only he is allowed to mate with the females. This is where Diane Fossey did her research on mountain gorillas. There are five families that tourists can visit; the other families are for research-only. Eight visitor permits per family are granted each day, each at a cost of $500 (! ), and the visits are limited to precisely one hour (though the hike can last quite a bit longer, like four hours each way). Conservation efforts have been well-rewarded; the mountain gorilla population has approximately doubled to 600-700 in the past twenty years. Lately there’s been a lot going on on the Congo side of the jungle. This marks the end of the wildlife-focused portion of our trip. This has definitely brought back some old dreams of becoming some sort of biologist. Exhausted beyond belief tonight. The Kigali Memorial Center houses powerful exhibits about the Rwandan genocide, along with other genocides of the 20th centruy. We tour the outdoor gardens and mass graves first – they are still being constructed. The first two levels are finished. The remains of over 200,000 people (of an estimated 800,000-1,000,000) will rest here when all of the graves are complete. The mass graves contain coffins, which contain multiple bodies. They are covered by large stone slabs. Colorful flowers brighten the landscape, but do not lighten the heaviness of the atmosphere. There are a few bouquets left to mourn the dead, and a very large black wall with small print to remember the names of the deceased (still in progress). A lot of the discussions today were about the ingredients for genocide – chief among these in Rwanda was a deep divide between the Hutus and Tutsis. When Belgians colonized the area they distinguished between the two, giving the Tutsis ID cards and preferred treatment. In modern-day history, the distinction is mainly a social one, not a racial one. There was marrying between the groups, and switching was possible. When it was unclear which group a person belonged to, the Belgians made the distinction on the basis of personal wealth, designating the rich as Tutsis. They were given cushy jobs in the government and were expected to control the Hutus, leading to widespread resentment. The genocide was carefully orchestrated, with propaganda being distributed through print and radio channels in the years before. This was particularly effective due to the low literacy rate. Name lists were assembled to identify targets. When a plane carrying the president of Rwanda was shot down, events were set into motion. Death was dealt by a myriad of gruesome tools – machetes, clubs, spears, and rifles. No one was spared; women were raped and killed, and children were killed since they were the future of the Tutsis. It’s still impossible to really understand the magnitude of the atrocity. The exhibits inside try to bridge this gap by presenting intensely personal views. They seek to de-desensitize people, who cannot comprehend the numbers because they are so large. Videos of survivor interviews play and color photographs document the events leading up to the genocide, the three-month descent into hell, and the aftermath. Articles of clothing found in mass graves have been retrieved and presented as outfits. Upstairs one orange room (filled with the profiles of children) led to another each with a brief description and horrifying cause of death. Another room featured skulls (some fractured) and bones from victims, along with dark, ghostly images of faces. It didn’t make much sense to me in high school, and now that I’m more familiar with what happened, it’s still not clear to me how things escalated so quickly and how the world let it continue. Sometimes the easiest recipes are the best. 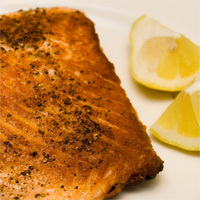 A simple piece of salmon, seasoned with salt and pepper, and seared to perfection, makes for a quick weeknight dinner. I only made one salmon fillet, and it was enough for two. Served alongside red potatoes and an arugula salad. 1. Heat a 12-inch heavy-bottomed skillet for 3 minutes over high heat. Sprinkle salmon with salt and ground black pepper. 2. Add oil to pan; swirl to coat. When oil shimmers (but does not smoke) add fillets skin side down and cook, without moving fillets, until pan regains lost heat, about 30 seconds. Reduce heat to medium-high; continue to cook until skin side is well browned and bottom half of fillets turns opaque, 4 1/2 minutes. Turn fillets and cook, without moving them, until they are no longer translucent on the exterior and are firm, but not hard, when gently squeezed: 3 minutes for medium-rare and 3 1/2 minutes for medium. Remove fillets from pan; let stand 1 minute. Pat with paper towel to absorb excess fat on surface, if desired. Serve immediately. Greeted by pouring rain at the airport. The Kigali airport looks quite modern, as does the city itself. There are a lot of new buildings, a lot funded by post-genocide foreign aid. Scooters taxi people around – a common sight is two people with green helmets riding on a single scooter. On the corner outside our hotel several men in yellow vests sell phone cards, and they also hold phones that can be used to make international calls. Prices range from $1 minute down to $0.20/minute. Internet cafes are plentiful, but connectivity is not that great – one cafe was out of commission when we went to use it. The one we ended up using had a slow connection, and a man shut down all power to the monitors in the cafe without warning. 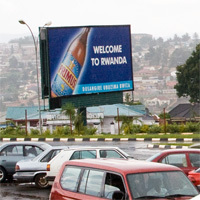 Service is not yet a strong suit of the Rwandans. Coffee took over 1/2 hour and we had to leave without being served because we didn’t want to be late to dinner. Dinner at an Italian restaurant took over 2 hours. Ellen’s laundry, promised to be done by 5pm, was not delivered within a half hour of the deadline so she stormed into the laundry room to find out what was going on. This is now one of the safest cities in Africa, thanks to a very strong stance against petty crime (apparently police can and will shoot thieves). It definitely feels safer here than in other places like Dar and even Karatu, but we don’t stray far from the hotel. California hasn’t been all that bad so far. In my first week, we had dinner with the in-laws, hung out with my parents, saw Ellen and Will, and attended Joey and Seoyoung’s wedding. Not a bad start. 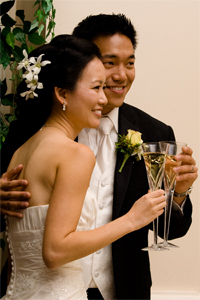 Joey and Seoyoung were married in a lovely outdoor ceremony at Summit House, in Fullerton, CA. It was pretty much a huge high school reunion with a lot of my favorite people from AHS, some of whom I hadn’t seen in over a decade. The reception was elegant and incredibly fun. 3rd grade: Joey moves to Arcadia: Not only do we go to school together, we end up on the same soccer team, forming a formidable back line. We both wear huge glasses. 6th grade: Highland Oaks graduation: In the yearbook, Joey says that he’s going to be the first Asian player in the NBA. He continues to play point guard in our pickup games. 7th grade: Foothills Junior HIgh: We all develop a love for Funyuns and the cafeteria’s chocolate chip cookies. Wilson joins our crowd. 10th grade: Bug-collecting: We kill some bugs in an acetone gas chamber and pin them to our box. The next morning, some of them wake up. We also get freaked out by a huge black bumblebee that sends us running away. 11th grade: US History: While working on a class project at my house (in the backyard), Joey gets a phone call. He (unsuccessfully) attempts to run through a screen door. 12th grade: Government Team: It becomes clear that Joey’s going to be a good lawyer some day. 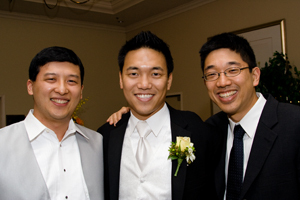 College: We bump into each other occasionally at Berkeley, and always hang out over the holidays. It becomes clear that Joey is becoming way cooler, more eloquent, buffer, and better looking than the rest of us. 2002: Joey comes to Boston for law school. With Wilson nearby in NYC, we get to hang out a good amount on the east coast. We end up at my aunt’s for Thanksgiving, where, inexplicably, the three of us end up sleeping in a single bed. 2004: Joey and Wilson serenade Jen and me at our engagement party. 2005-2008: Joey gets a law degree, new job, new place, new car, and new wife. It’s been an eventful few years for him. Seoyoung and I don’t go all the way back to 3rd grade, though we were friends in high school. It’s been great to catch up with her over the past year. Hopefully she’ll forgive me for no longer following the Mighty Ducks and the NHL (who does these days, anyway?). Here’s to their new life together and many more decades of friendship between Joey, me, and our families. Before I left Boston, one of my young colleagues invited the team over for dinner. Our expectations were pretty high, as we’d heard all about his adventures in culinary school at El Centro Superior de Hosteleria y Turismo de Valencia, something he did for six months in between college graduation and joining us at Endeca. This was the first dinner party I’d been to with a menu. Broth: Restaurant-style paella calls on ready-to-use broth whereas traditional paella requires the broth to be made as part of the paella-cooking process (adding over 4 hours to the cooking time). Meat: The meat is browned in olive oil and sprinkled with a good amount of salt. It was set aside after it was done. We cooked chorizo, chicken, rabbit, and shrimp. Sofrito: The most important part of the paella. Ours was a combination of minced garlic, crushed tomatoes, saffron, and some other stuff. I probably should have paid more attention given the importance of this step. Rice: Short-grained rice was mixed in and spread around and allowed to cook for a few minutes. In the final dish, the rice is not supposed to be soft. Putting it all together: I missed the arrangement of the ingredients, but everything looked amazing. After 15-20 minutes all the liquid had been absorbed or boiled off. The most important thing to do at this step is to resist the temptation to stir. A great paella has a bit of crust at the bottom of the pan. I’ll track down some real instructions at some point. I just made myself really hungry. The paella and everything else was delicious, and I was really grateful to enjoy the food and company at my last dinner in Boston.